Naina: Mama I had a nighmare last night. Mama looks at her concerned. Naina: Mama, do u know what a nightmare is??? Mama: Yes i know, shall I explain??? Naina: Ofcourse I know what it is, I wanted to know if u knew. Mama looks irritatedly at the all-knowing 6 yr old who thought her mother didnt knw the meaning. Nikita snickers, understanding her mothers indignation very well . Ma: Why, why cant u tell me...was it so terrible????? Naina: No no it was a nice nightmare. Nikita goes for Arabic tuitions but Naina doesnt but she needs to learn too. Since Naina just needed to know the basics I ask Nikita to teach her. Nikita doesnt show the slighest interest. So to awaken Nikita's interest I tell her that just like how I pay Sabha didi[Arabic tuition teacher] to teach u, I'll pay u to teach Naina. Now Nikita is interested. And we agree she'll get Dhs.10 per month if she taught Arabic to Naina. So she starts to teach Naina...soon Naina is not very happy at her sister's bossy ways and refuses to learn under her guidance. Nikita is depressed and approaches me for a solution. I tell her "If u want the 10dhs u must find some way to make her learn". She replies sheepishly "I told her I'll give her half of what I get if she allows me to teach her"
If I have 7 oranges in 1 hand and 9 in the other what do I have???? asks Naina to her sister. Mama who overheard this was very happy that her children were studying even before she told them to take out their books. "My children are growing up and recognise their responsibilities" she thinks fondly and moves closer to listen to the answer. "It means u have very large hands" Nikita answers and both fall back onto the couch and laugh gleefully. After 45 minutes of heightened activity I order the kids to take a break from the wild games they were playing. So they flop down on the floor and rest. Naina: "I wish we had 2 brothers." Naina: Havent u seen their cartoon??? For them "there is no such thing as an ordinary day"
Nikita: Or I wish we had 10 sisters...then we could be the 12 dancing princess. Mama[gets up agitatedly]: U two have too much free time in ur hands. Go get your holiday homework both of U.....NOW. Child: Its on its way. Mama: U r not doing potty are u??? Mama[at the end of her tether]: How long doesn it take to pee??? Anybody will think its coming from the Himalayas??? Child[interestedly]: Himalayas???? Where is that??? Mama: Himalayas are mountains found in the northern most parts of India................detailed explanation follows. One day when it was snowing Tom went out to post a letter he saw an enormous sight. He saw a bundle of cats sitting on chairs and it looked just like a party. He began to join in but the cats pushed him out and Tom became very sad. Then Tom had an idea. He went to them and said " Please" and the cats said ok. Moral of the story: Always say please before doing or taking something. ;-D.......dont miss the words in italics; incase u r wondering Nikita didnt have the patience & gave up half-way. The Final exams are finally over and the kids have 1 whole month of holidays before they start their next session. I have my hands full and am running around like a hen without a head. Wish me luck.....there's another 3 weeks before school starts. Whooppee - super post. May every day of the holidays be exactly like this so that you can make such grand posts every day. N&N - make sure mama is "fully occupied" OK ?? Keep them coming more please ! LOL Aren't they delightful!! Only thing I don't understand is why - just because they said 12 sisters (sounds great to me), did you ask them to start their holiday home work! Not fair! hahaha what a brilliant post. And what a bunch of kids you got there. Soooper! Varsh: U do have a point abt the brain washing....I end up feeling like a fool saying "I dont know" 23 times out of 25 when they ask a question;-(. Told you...I heard from a friend...her son who's barely 5 yr old...tells her that she knows nothing...his teacher's very intelligent! Your wonderful narration brought to me memories of my childhood days and how I used to enjoy pestering my mum. Just loved loved this kids stuff. Its so cute to sit on my comp and read abt them. Even though they are quite funny, sometimes I can see you rolling your eyes !!!! LOL !!! Bathroom seems to be the great place for knowledge !!! LOL !!!! And that is so cute - the figures they have done with clay !!! Its so beautiful, too !!! Uma: U dont know half of it....sometimes I think I'm not cut out for motherhood;-(. "Mama, do u know what a nightmare is???" SOOOOOOOOPER! And I am still wondering how Mama found time to type this much... Nikita and Naina mustv'e been sleeping! Got a good laugh. At office. Boss not rolling eyes anymore. He knows. In a way, am happy that they have 3 more weeks off...we'd get more doses of fun posts! Made a wonderful read Nancy! ** I laughed hard imagining you as a headless hen!! :D All the besht Nancy. Hugs to the lil ones! Your kids are seriously fun! I am sure there's nothing called boredom around u!! They are amazingly funny!! Me and my daughter were reading it together and laughing! She is now interested in meeting Naina and Nikita!!!! :D So what say about that long pending meeting???? I found your blog through a very old comment on mine. I am so sorry I was so late in responding---and I loved reading about your world so much. It sounds so much like mine! now that made me laugh through n through...witty girls you got :) precious :) muuuah to them both ! Aweeee !!! Such lovely kids Naina and Nikitha. As I was reading the post, all along I was actually visualising their facial expressions and laughing out loud. Can you believe it that I actually guessed about the nice nightmare as something related to Momatassim :D Isn't he a sweet boy !!! On a serious note, how are you managing all the works along with the kids and yet finding time to write all this stuff with such elegance. Don’t you get tired??? You may get angry or frustrated on them sometimes but at the same time I can see how much happiness they are spreading in your life :). Please show this post to the little angels See even I added “please” here. Hehehe. Lots of love, keep enjoying. And loves the little dolls. The girls made them??? PS - I wish all my nightmares were nice too. keep telling urself when you want to tear some hair off " if not for the kids, who else is eligible to frustrate you (mum) at this rate with thier mischief? only kids are capable of this"
oh, BTW.. the intellectual thought belong to my mum who still suffers from non stop giggling episodes..
Each and every story had me smiling and laughing out loud. I look forward to plenty more where this came from especially since you have three more weeks to go. nance hope u are all better now. i couldn't enjoy this post because i couldn't help but laugh out loud at each episode which brought on the racking coughs to top gear:-)) i beg of u. please keep this up and i'll deal with the cough. Anusha: Oh yess time sure flies when they are around;-P.
Wannabewriter: Whats there to ask.....anytime;-D!!!! Hypermom: "It sounds so much like mine!" I remember feeling the same when I had commented on ur page:-). Welcome to my space!!!! Nu: They r getting too smart for my liking;-/. Will pass it on;-D!!!! Asif: Oh Momataasim is history now;-D. Here generally dreams are abt her being Rapunzal or Cinderalla & the prince will be some cartoon character;-/. I didnt really write all this at one go. Whenever I find something funny I note it down coz I have this tendency to forget. So yesterday I just sort of put all the incidents together and made a post out of it. Swathy: Hehe thts what I also felt until a friend who has older children told me that these problem will be replaced by other problem then. "my mum who still suffers from non stop giggling episodes..
only difference, now she joins us..:)"
Lan: Goodness ur cough hasnt gone yet. Here I'm quite ok infact its so hot now tht I'm having ice-creams & other cold stuff;-D.
Aha u started huh...but u didnt read book 3....u mustn't miss it, u got to read tht one, I had really liked it:-). 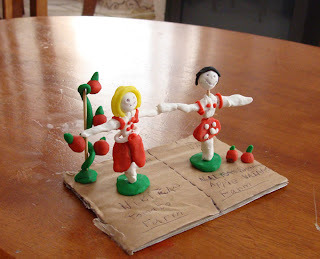 Lovely creations of the tomato and apple farm! The joke book--same thing my younger one does! Onlooker: Till last year even we had just 2 weeks but from this year they've made it 1 month;-/. Oh Nancy -- they are adorable, aren't they :-) Love love love this post. p/s: Scribble hasn't posted in 4 months. What should we do? OMG, Nancy, you sure do have a way of make us all laugh. No wonder there is a saying...laughter is the best medicine....Oh! No Doctor Nancy...I am not ready to pay the fees!! kid:: yeah, it came but went back inside!!!!! Lovely post !! I love these conversations you have with your daughters. Reminds me of my own days when me and my 2 younger sisters used to talk such silly with my mom and she would just go crazy during our holidays !! Man.. u have a live cartoon channel n u are complaining.. i would do anything to have such entertainment filled days!!!! I love their wittiness and not to forgetn obserfvant nature! This was one of the most refreshing posts ever.. am glad i stopped by :)... oh by the way do think about the 12 sisters thingy.. might be a 'nice nightmare' ;p! My first time here! I have been smiling throughout! "A hen without a head!" Lol. Good one! 7 oranges in one hand and 9 in the other!! --This had me in splits!! Beneath all these rants,You definitely are amused to heaven, aren't you?? Thanks for sharing with and lightening early in the morning!! Well your post had picked me up again when I read it and your girls seems as humorous as you, well that's the best thing way to live life, take things humorously. I have two girls and I can really relate to how the converstation goes, I loved the nice nightmare part, my little one too comes up with such instant punches, I love it. U'll never believe this but the night after I read this I dreamt that ISH pleaded with us to give her another chance;-o. So thts wht we'll do right now...give a week to put up her post. What say????? Yep the throat is much better, thanks;-)!!! Thank U and welcome to my space:-))!!!! Nikita Banerjee: Thank U!!! Glad u enjoyed the post:-))!!!! Savitha: When I look back I find most of it funny but honestly sometimes they try my patience;-D. Glad u enjoyed it:-)!!! Very cute and extremely funny, what girls!! But I just found out that Bins and Uma are close friends and that just just melts my heart. Beautiful one.. specially the one where you said, how you taught them about Ganges, Africa etc,, Totally hilarious..!! I'm sure posting these here, you have sure made a superb collection for them to read when they grow up..!! And yeah.. Have great fun during the holidays..!!! Awesome! The kids are adorable :-). Wow! they r just adorable!!! I hope I was half as fun when i was a kid! There isn't a single boring moment in this household now, is there?...lol! Hey Nancy, I was reading this at work ;) and had a hard time controlling my laughter. All the best for the remaining holidays Nancy. Hope it will be as interesting so that you can post many more such posts. :) Take care. They have inherited your sharp sense of humor. And did the make those things at home. Brilliant!!!! Happy Easter to you and everyone at home! Yeah, where r u?Holidays over right? Nancy, where on earth are you??????? Agnes: Its time to get tough with Ish..gimme a few days I'll come up with something;-|. U never knew abt bins & ums;-o...surprising how u missed this coz they keep mentioning it in everyother post;-D.
Destination Nowhere: Thanks, I'll take the credit;-D!!! Sparkling: Good to see u back;-))!!! Shalom: Thanks I sooo need the best wishes;-D!!!! Wanderlust: Thank U, hope u had a good day too:-))!!!! Shas: Thank U and Welcome to my space:-))!!!! Beautiful piece,are they into indian or british curriculum? BTw whats that decor on the table? They study in Indian schools. They've made scarecrows out of clay & they are supposed to be guarding the tomato & apple farm:-).